Larry Fonacier’s big three in the fourth quarter doused a fiery rally by the Elasto-Painters and sealed the 1-0 Championship series lead for the top-seeded Tropang Texters. That was Fonacier’s second trey of the game, and it couldn’t have come at a better time for coach Norman Black’s wards, who are seeking an unprecedented All-Filipino/Philippine Cup three-peat. Old reliables Jayson Castro and Ranidel De Ocampo led the way for TNT with 16 points and 7 rebounds each, while Jared Dillinger outplayed Gabe Norwood by scoring 13 points on top of 4 rebounds, 3 assists, and 1 steal. Talk N Text limited ROS to just 35% FG shooting while also beating them on the boards, 56-51. The Texters also shot well from beyond the arc, connecting on 10 of their 27 attempts while the Painters converted just 4 of 21 tries. Jervy Cruz, Paul Lee, and Jeff Chan all scored in double-digits for coach Yeng Guiao’s crew, but they shot a combined 10-of-34 from the floor. Lee and Chan made just 1 of their combined 8 three-point attempts. 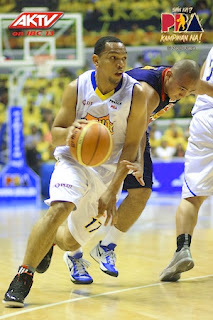 The Elasto-Painters will try to even the series in Game 2 on Friday, January 11, 2013. Meanwhile, Philippine Basketball received a SHOT IN THE ARM when FIBA Asia’s bigwigs came to their senses and FINALLY awarded the hosting of the 2013 FIBA Asia Men’s Championships to the Samahang Basketbol ng Pilipinas (SBP) – something they already should’ve done late in 2012. In doing so, Manila will be the host city for the biennial meet. This means that the Philippines will be awarded an automatic slot in the tournament, and, as a consequence of SMART-Gilas placing in the top four of the 2012 FIBA Asia Cup, three other Southeast Asian teams will be guaranteed places in the tourney. Paging Thailand, Indonesia, Malaysia, and Singapore! Time to step up big time, folks! Now, this should really shake things up in the local basketball landscape this year. Why? Because now that, AFTER FORTY FRIGGIN’ YEARS, Manila will host the tournament, it is IMPERATIVE that we send the BEST POSSIBLE NATIONAL TEAM. It would be a travesty, a terrible irony, a shameless act, a CRIME, if all stakeholders in Philippine basketball (the SBP, PBA, UAAP, NCAA, the MVP Group, the SMC Group – EVERYONE!!!) do not gather and unite for this glorious, patriotic, and righteous cause. This is the PERFECT time to show our countrymen, nay the WORLD, that Pinoys can set aside differences for a goal bigger than our fragmented selves. Destiny beckons and we must respond accordingly! Let’s go Philippines! The Talk ‘N Text Tropang Texters turned back a furious fourth quarter rally by the Rain or Shine Elasto Painters to win the first game of their Philippine Cup title series, 87-81, Wednesday at the SMART-Araneta Coliseum. The two-time defending champions relied on balanced scoring attack featuring six players scoring at least eight points. But Talk ‘N Text made hay on the defensive end, hounding Rain or Shine to below 35 percent shooting. “I was really happy with the way we played defense tonight,” said Talk ‘N Text coach Norman Black. 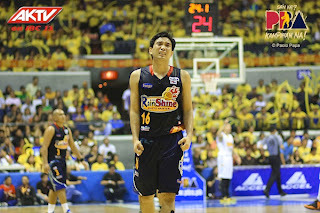 The Tropang Texters focused much of their effort on Rain or Shine’s top guns, Paul Lee and Jeff Chan. Lee scored 11 points but shot just 4-of-14 from the field, while Chan scored just two of his 10 points in the second half on 3-of-12 shooting, missing all four of his three-point attempts. Rain or Shine trailed by as much as 16 points, looking dead in the water early in the fourth quarter. Talk ‘N Text still led, 77-62, early in the final period before the Elasto Painters rattled off a 13-2 run to cut the lead to just three points. But Larry Fonacier hit a three-pointer in the ensuing possession, to push the Talk ‘N Text lead back to two possessions, 82-76, and the Tropang Texters kept steady in the clutch to seal the victory. Jayson Castro and Ranidel De Ocampo paced Talk ‘N Text with 16 points apiece, while Jared Dillinger added 13. 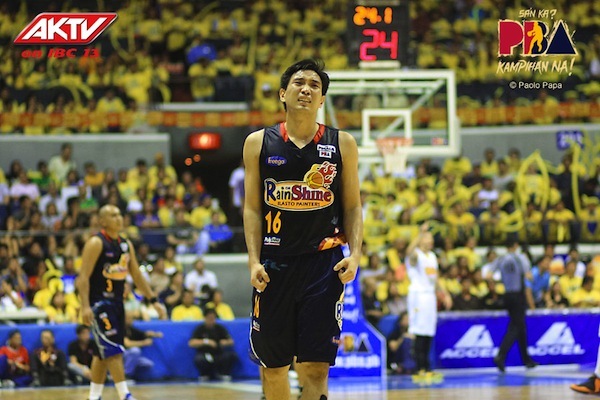 Game Two of best-of-seven series is set Friday at the SM Mall of Asia Arena. 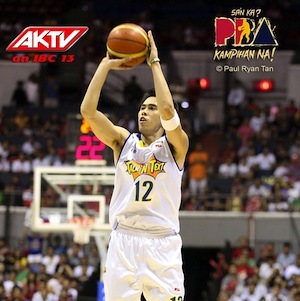 TNT 87 – Castro 16, De Ocampo 16, Dillinger 13, Fonacier 9, Alapag 9, Peek 8, Williams 6, Raymundo 3, Reyes 3, Alvarez 2, Carey 2, Gamalinda 0, Aban 0, Ferriols 0. 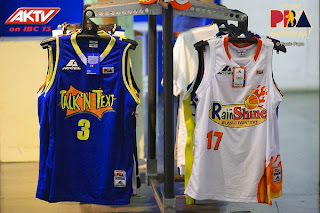 ROS 81 – Cruz 13, Lee 11, Chan 10, Norwood 8, Rodriguez 8, Quinahan 8, Tiu 5, Belga 5, Ibanes 4, Matias 3, Arana 3, Tang 3.
in the opening game of the 2012-2013 Philippine Cup Finals. Jeff Chan grimaces as his shooting hit a snag in Game 1. Jessica Mendoza didn't disappoint anyone -- for sure! 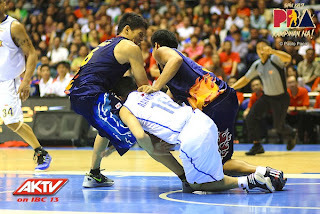 as he's sandwiched by Jireh Ibañes and Larry Rodriguez. TNT or ROS? 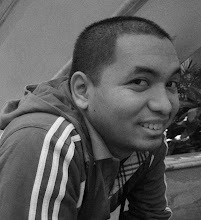 Saan ka? Kampihan na! Complete box scores may be seen here.